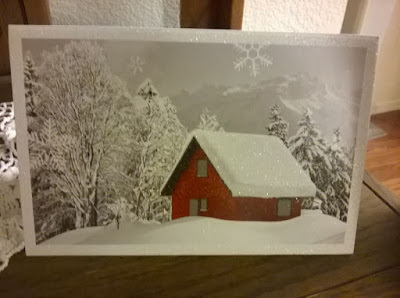 If my self-esteem was measured on how many Christmas Cards I receive each year - I would be on a major yuletide downer! Only 1, at this date. 1. It would help, if I sent them out. Then perhaps I would get some in return. I haven't done that in a few years. My husband is the one, who has always been thoughtful and enjoyed this Christmas ritual. When I was a kid, I remember my parents received 100's of them. A lot of them, were from customers from my dads business. We also have a big family that lived across the country, so of course that was the time, to update us with photos and letters. Now days. with Facebook and all, they just don't send out cards anymore. 2. I haven't gone out to the mailbox yet. Now isn't that just plain silly. No it's LAZY. It's cold out there. I wait it out, hoping the husband will walk out to get the mail. We have these cluster boxes - I avoid them during the rush, to pick up mail, because I don't want to have to talk with the neighbors. I know - I am bad. I mean, if I see them, I am nice and friendly. I just don't have anything to say. Recently, the cluster mailboxes have been vandalized with mail stolen. So far, ours hasn't. That knowledge was enough for us, to retain a PO BOX and have all of our mail that is bills, or has information sent to the PO BOX. The Christmas Cards, wouldn't have gone to the PO. So,one of us, will have to go out and get the unimportant mail. I haven't sent out cards for a number of years either. It is just not the same, is it? What I do is when I receive a card (and so far I have only received ONE also) then I mail one back to that person. I remember my mom used to tape the cards all around the doors and windows and they became part of the decorations. How time has changed. She wouldn't even be able to fathom how we keep in touch over the Internet! I did get another one yesterday. I am UP to 2. Maybe it's up to us, to restart this tradition, regardless. Maybe next year! It will take me that long, to find everyones addresses. If I could send them, I'd send you one! Awww how sweet. I just ordered a cute dress from China. Lulagal - It should be here today. Took awhile. That's nice. We've just been so busy - Maybe we'll start next year.